Cyclone Gaja hit the south India states of Tamil Nadu, Kerala, and Puducherry, taking the lives of at least 45 people. 117,624 homes were lost and over 700 livestock animals killed. There are 493 relief camps with 100,000 people. Cyclone Gaja had hit Tamil Nadu on Friday, November 16, 2018. 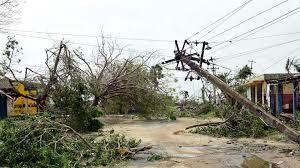 There was damage to 88,102 hectares of crop and 39,938 electricity poles were also damaged in the cyclone.